I’m loving this baby series! It’s been so fun to play with the chubbiness of their cheeks and arms and get to know their proportions better. I knew this little lady was going to make my assignment easy. Kaitlyn is the daughter of some friends from church, and is definitely, not even probably, the most photogenic and comical baby I have ever seen. I had a hard time choosing which photo to base her portrait on because they were all so good! The title comes from what was actually on her t-shirt in the photo I referenced, but I decided to leave it out for my pic, just to make it flow better. 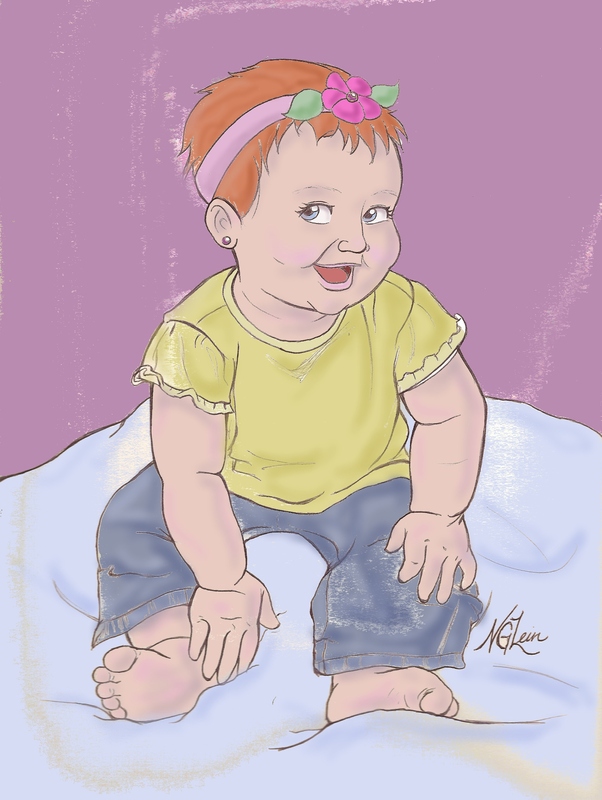 I loved drawing her plushy little hands and feet, and the shading was really fun to do, too. I guess she doesn’t necessarily have quite this much hair, but I’m still working on how to make wisps of color instead of fully blocking out a section for a specific color.